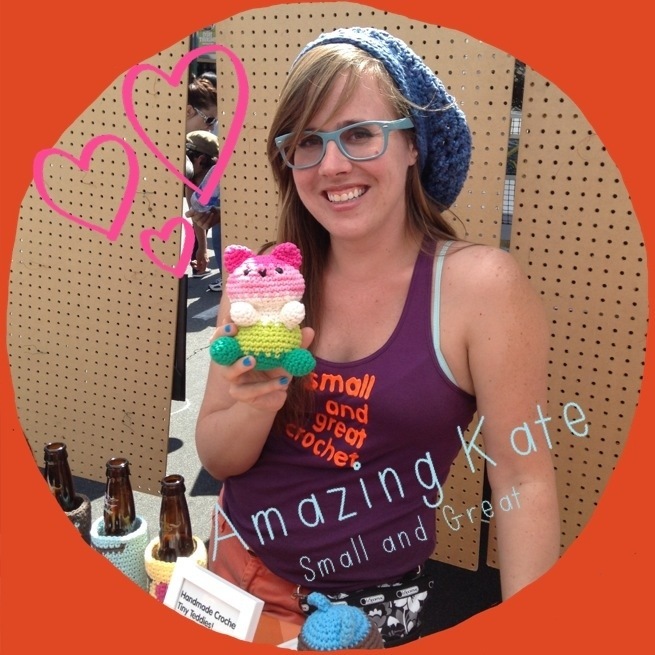 And now, time to meet the lovely Kate Wood of Small and Great Crochet! So who are you and what do you do? My name is Kate, and I’m a bit of a crochet newbie — I only learned how to put hook to yarn in March 2011, when my mom (who was just learning herself) taught me the basic stitches during a long car trip. Before I really even had the basics down, I was off and running! Err, I mean, stitching. I went from granny squares to amigurumi to Tunisian crochet within just a few weeks, and a year in, my apartment looked like a yarn store. My friends’ and family members’ homes overflowed with the stuff I’d made, too. I make all crocheted things great and small! I design all of my own original patterns. I really have two directions I go in. One is my accessories, which are made from hand-dyed yarn. My yarns are named after the gemstone streets in PB, and my patterns for hats, scarves, and more are named for places around San Diego county.Two is my amigurumi, which more or less means “soft toy” in Japanese. Little stuffed critters! My tiny teddies (the little striped bears) are my bestsellers, but I do lots of other stuff. Making their debut at the SDICM will be ladybugs! I would like to interject here and say that, as an owner of one of these “tiny teddies”, they are absolutely adorable and EVERYONE needs one! What are your favorite materials? Yarn, of course! But I really love working with natural fibers the best. In particular, I have hats that are done with a hand-dyed organically-grown cotton that are just yummy. I also dye a cotton/acrylic blend that I’m really fond of — it feels like an extra-cuddly version of your favorite t-shirt. Who and/or what inspires you to create? A couple of things. One, I’m very inspired by San Diego. Besides all the pattern and dye naming, my accessories are all geared toward a SoCal aesthetic — laid-back but luxe. Second, nature — I know the stuffed toys and gifts I make are cartoon-y/kawaii versions of the real animals, but I just LOVE animals and plants, which is why I keep stitching them! Also the reason I got into crochet in the first place is my family. My mom, and my beloved late grandmother, are/were both avid knitters, and really good at it. I always wished I were good at it, but I am all thumbs when it comes to knitting. My mom was taught the basic crochet stitches a couple of years ago by a friend, and though she didn’t really get the hang of it, she figured it out enough to teach me. Once I started, I basically never stopped. Care to show and tell us about your five favorite creations? 1.) My little horse — I kept the first successful one I made (this pattern is HARD and it took a TON of trial and error to get it right). He’s become my unofficial mascot! 2.) The “Carlsbad” hat — this is a slouchy beanie worked in hand-dyed, organically-grown and processed cotton. The pic I attached shows examples of the hat in four colors — L-R: Garnet, Turquoise, Tourmaline, Sapphire. It’s the hat I wear the most myself (in the pic you have of me from North Park it’s what I have on). 3.) The “Tiny Teddy” — consistently my biggest craft fair hit. I get custom requests for these guys too. I’ve had several people ask me about doing a smaller version (an even tinier teddy!) so that may be in the works… it needs more testing before it goes live. 4.) My crocheted states. I know these don’t really fit precisely with either of my “themes,” but it was all the enthusiasm and encouragement that I got from giving these to people as gifts that really motivated me to turn crafting into a business. Another interjection here: these are super cute too! 5.) The “Swami’s” scarf — this is a pic of the mini version. I also do the Swami’s stitch as a headband and a larger scarf. I wind up using lots of circles (e.g., my whole booth display is patterned with giant orange circles!) so I feel like this is kind of my signature stitch. I meet a lot of crocheters via this scarf style — people always want to know how it’s made. And lastly, where can the good people find you? Haha, where can’t I be found! Kate is great, guys! Show her some love by checking out her Etsy shop (http://www.etsy.com/shop/smallandgreat) or my visiting her in person at the San Diego Indie Craft Market on June 23rd from 2-6PM at Queen Bee’s Art & Cultural Center! Are these not the cutest things? !